I'm an office worker Mon-Fri to pay the bills but spend my spare time with my hubby & adorable kitty, writing articles, & giving all sorts of craft & DIY ideas a go with my "limited" skills. I have just started my very first blog www.easypeasy101.com which is designed for craft, DIY, & culinary challenged people out there. Basically if I can do it then anyone can. 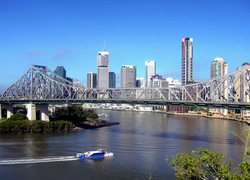 Is the G20 Summit a positive event for Brisbane or a negative? Would you rather live in the city or in the country?